I do not usually like boats. Rivers and lakes… it’s just too flat!! But I do love checking out new wilderness areas. 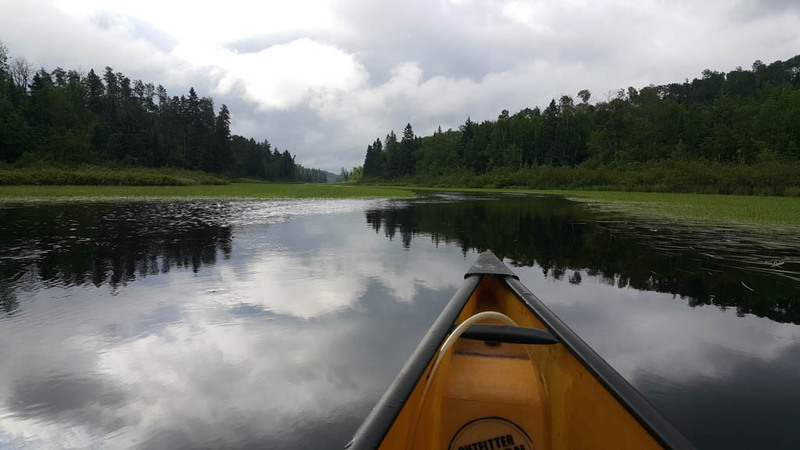 So when my sister asked me to spend some time in Minnesota’s Boundary Waters Canoe Area Wilderness, I jumped at the chance to go. I flew in from the west coast to Minneapolis, where she is going to school right now. From there, we drove four hours north to a small town called Ely. We stopped at Voyageur North to pick up our canoe rental and permit. Unlike my usual climbing trips, this required a some advanced planning. Everyone needs a permit to enter the BCWA. This is to help make sure people are following Leave no Trace ethics and popular spots don’t become overcrowded. We had reserved our permit four months earlier. On this particular day in late June, it was very windy and cold. Katelyn carrying our canoe on the first portage. She is not sure if lightweight is a good way to describe it. And this woman was right. We two novice paddlers spent the next few hours fighting to keep the canoe from careening into the side of the river bank and slowly moving forward against the wind. There are no photos of this, because I was trying really hard to just keep paddling. And not freak out. My back was just starting to feel OK again since my serious back problems started 6 months ago. And I really didn’t want to overdo it and be unable to move again in the middle of a windy river. First camp site we saw, we stopped. Then the weather then smartened up. We had a lovely evening cooking over a fire. The bugs started becoming bad around 9:00pm, so early to bed with us. This meant I woke up around after my usual amount of sleep in the middle of the night. Lucky for me, I was rewarded with some of the most amazing views. Now this is what I thought canoeing would be like! 4:30am: a magical time to wake up … only when you are camping. The next day, we decided to take things easy for my back. We headed to a nearby spot only about an hour away. Then after lunch, a swim and a nap, it was time for a day trip! Bye bye tents! See you soon. We checked out some nearby rapids and waterfalls. Then there was more time for relaxing and hanging out. Really quite nice. The morning of day 3 went we were halfway done with our trip. So now we had to slowly meander on back towards where our car was parked. We took another side trip to check out another lake. I had been asking people we ran into about updated weather forecasts, and we were told thunderstorms were predicted for later that day. So we decided to find another campsite before too late in the day. Thank goodness we did, as we could barely get our tents up fast enough to find some shelter! This was one of my favourite memories of the trip, as my sister and I were having fun playing cards … trying to distract ourselves from the loud thunder rolling in. After the wind and thunder calmed down, it was still pouring. The bugs were also unbelievably bad. So we cooked dinner while sitting inside the tent. That rice with apples and walnuts was the tastiest thing ever. My sister finished the evening with a solo canoe paddling around the lake, looking for wildlife to photograph. As I watched her put the canoe in the water herself, and then paddle off, I had to smiled. I often have the same inclination to just go wander off in the woods (… or lake…) alone and was nice to spend time with someone else who felt similarly inclined. I, however, am a person recovering from an injury. I do not get to wander off on my own at the moment. So I covered myself with long pants, long sleeves, socks and 100% DEET. Then I sat down on my tarp to do my nightly physical therapy routine. This did not last long, as the bugs were eating me alive. Worse than any night before. I had to take shelter in my tent and cover myself with anti-itch cream. I heard those mosquitos buzzing around me all night long. We woke up early at 6am to try to beat any the storms that had been predicted for that afternoon. The distance that took us hours to do the first day were quite easy now. Even though we saw dark clouds behind us, there was nothing but bright skies ahead. It was so relaxing. I could have kept going all day. We were all packed up back at the car by 10am. I wish we had been canoeing longer! We took the long way home and stopped by Lake Superior. Reminded me of the ocean at home. Best news of all … my back is feeling fantastic! All that napping and gentle paddling was very good for me. On to more summer adventures. Very scenic and looks like it would have been fun for me, 30 years ago that is! I will pass the link on to your cousin. This reminded me of his camping, canoe, and raft trip to Yellowstone several years ago. Take care kid and stay safe.